Thank you all for the comments, finalising an 'industry' has really helped the creative juices alot! henrix72se wrote: Just my two cents. Thanks Henrik, I felt the track looked a little less 'established' than it should too...and I just love grassy track so it was a must! I have some dirt hanging around somewhere I can use. 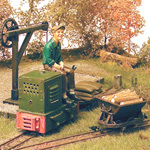 Steve Bennett wrote: Great concept with the charcoal burner Simon. Wish I had thought of that one, as it is an ideal subject for a small gauge like Gnine. Thank you for those links Simon, very useful, seeing all of the different designs means there are plenty of options to make and interesting scene in there. Last edited by demaine22 on Mon Nov 07, 2011 1:37 pm, edited 1 time in total. Looking good Simon, the camera has given a better shots than the phone and it is easier to see the ground cover is not quite as dense as the previous shots looked. I would forget the macro setting on the camera, for the most part they make things worse for close up shots. On most cameras they will reduce the amount of the image that stays in focus and are really only suitable for small objects like a single flower etc. Might be useful for a side on shot of a loco for example, where most of it will be the same distance from the camera, but for anything with much depth, normal settings work better. Super modelling. The little model is gaining quite an atmosphere. Ditto on what Steve says about the macro setting on a camera. Mount your camera on a tripod. Switch it to manual settings, stop the aperture down as much as possible say f16 at least, then shoot with a shutter speed in seconds rather than hundredths of seconds. For example the shot on the top of my nano model railroading blog http://nanomodelrr.blogspot.com/ was shot at f22 aperture with a 30 second exposure time. The exposures were so long that a couple of times trucks went past on the road outside our house shaking the camera set up. - Something to hold the camera - a tripod is good, but I didn't like the idea of screwing a metal tripod screw into the plastic fitting on my camera. Instead, I made a camera holder from 2 bits of ply at right angles with a hole in the vertical one to go round the lens base (this holds the camera enough, or you can use rubber bands). I put a small bit of wood under one edge of the flat bit of ply to adjust the angle of the shot. - A way of taking the shot without touching the camera: IR remote, internal timer or a shutter cable. In principal you can avoid all this by shooting outside in sunlight or on a sunny day just in the shade, but I find this is unexpectedly hard to do. I use macro or not as needed with no problems. Thanks for the photo tips guys! I wanted to do some pics outside at the weekend but the constant threat of showers held me at bay! Ian - Never heard of nano modelling! Bordering on the same amount of insanity as Steve's dragon fly! Last edited by demaine22 on Mon Nov 07, 2011 1:38 pm, edited 1 time in total. 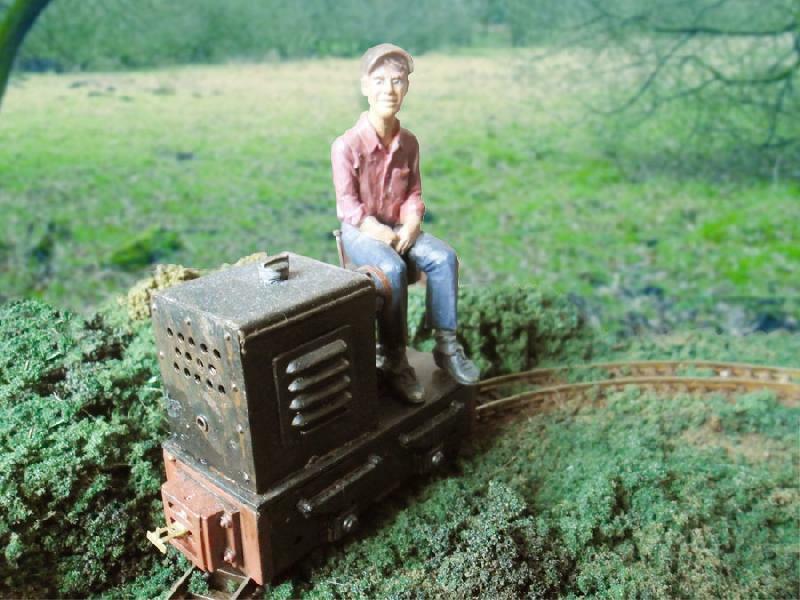 I was quite taken by the idea of a small railway to transport charcoal and some of the links posted here to youtube got the creative juices flowing. It seems that a lot of the charcoal kilns used for small scale production, utilize old oil drums for the kilns and as I have a few of them around the place, had to have a play. The charcoal kiln (on the left) is really nothing more than a standard oil drum with a chimney added and then placed on a brick base. A simple modification and doesnt take up much space either. The one on the right is just a rubbish burner given a similar treatment and again the simple modfication makes for quite an attractive item that would fit on many layouts. 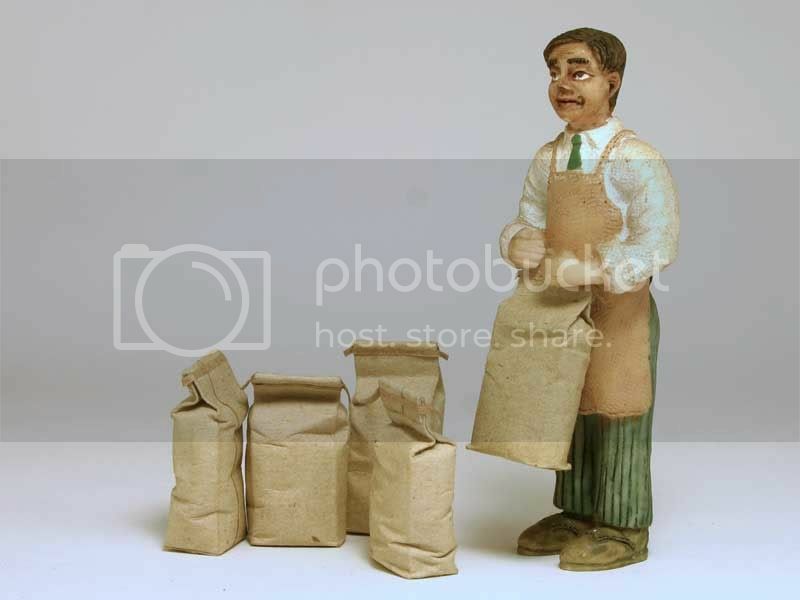 Guess I had also better mention the paper sacks to take away the finished charcoal to market. These are based on the dimensions of a 25kg potato sack which seemed ideal and not too small to be able to work with. After experimenting with several different types of paper, a plain old brown envelope seemed to give the best texture and ease of working with, being soft enough to get a bit of shape to them. I think they serve greatly as inspiration, and I hope they do for others too! I think the sacks have changed sizes since I last emailed you. Using the potato sack dimensions I think gives better proportions than my first attempts. I'm rather taken by those sacks. I trust they'll be available by ExpoNG? skylon wrote: Now you've done it! I am hoping to have some made up for ExpoNG, a lot will depend on available time though. As you can probably imagine, they are quite time consuming to make up, but I am getting quicker and more efficient. Feverish activity tonight on the layout...well actually Eddie was doing circuits for a couple of hours whilst I chopped up some card to mock up the kiln. Motivated by Steve's handy work with his kilns, I decided I wanted mine to be based on the one I saw in Wales, although this was surrounded by metal..mine will be breeze blocks or concrete, as other designs I have seen do this, I assume, to protect the surrounding area a little. Removing the large log store altogether means the kiln is more the star of the show, and personally I prefer this to having too much centre stage, maybe a small pile of logs nearby ready for the next batch? I would agree about having the kiln in the centre Simon, it does look better there. Is there enough space to have the log store on the outside where you first had the kiln, I think that could work visually. The log store is a few mm too wide, caught on Tiny as it travelled past. What I think I may do is make a smaller version, and keep the larger one for another project - gives me an excuse to get some staining practice in! instead of building downwards , how about building upwards, creating a tunnel through small hill, with log store on top. Not uncommon for woodland to be on hillsides. With larger scales, I often find it is a good idea to make use of the Z dimension, which is why I often say that the bigger the scale the less space is required. 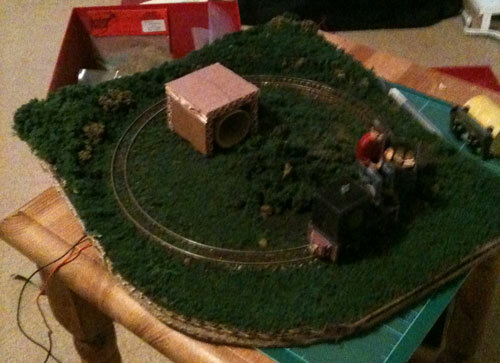 Sat with the layout last night making some alterations, there will be no need for a larger base now (or a new one! ), I hope to make a little improvement to the centre as well to make my life a bit easier with the centrepiece. rue_d_etropal wrote: instead of building downwards , how about building upwards, creating a tunnel through small hill, with log store on top. Not uncommon for woodland to be on hillsides. With larger scales, I often find it is a good idea to make use of the Z dimension, which is why I often say that the bigger the scale the less space is required. Thanks for the suggestion Simon, I want to keep the height of this layout down for storage reasons (As if by coincidence it fits in my 'bits box'. However with my next project I want to try adding a tunnel. Looking good. I must say, i quite like the look of having something outside the circuit. I like the look of the train passing between the two features. Just my ha'pennys worth though! I'd vote for the log store in about the original position and the kiln inside the track as well and at about right angles to the store. This would start to define a nice roughly rectangular space in the middle of the layout, with objects on 2 sides. 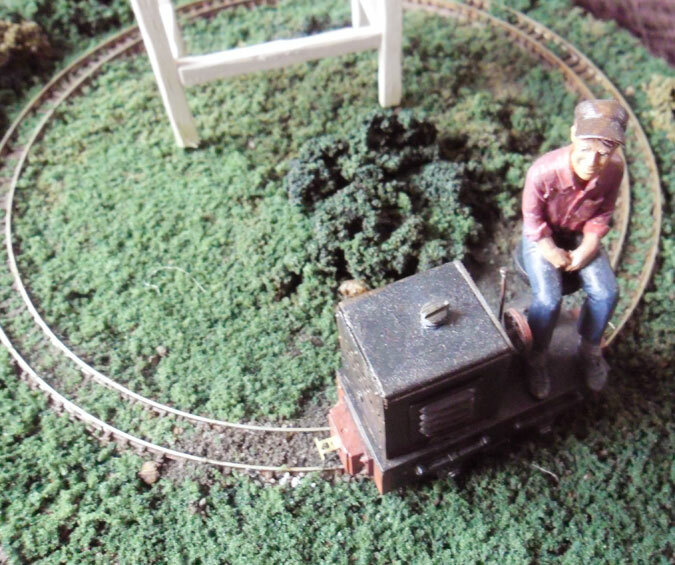 Then maybe another object (lunch room, toilet or fence) outside the loop of track to make a third side for the space. The space's surface could be brick or gravel. PeterH wrote: I'd vote for the log store in about the original position and the kiln inside the track as well and at about right angles to the store. Peter I think I understand what you mean, I always imagined the curve to be the 'front' of the layout with the front of items facing there...roughly as if facing stage front. 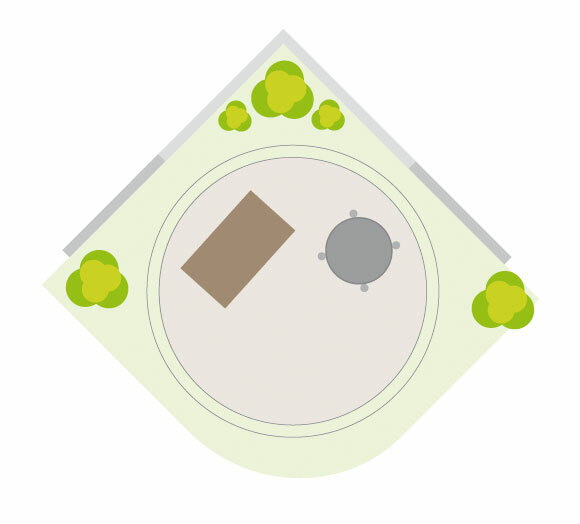 The reason I would change design is I feel the one I currently have would possibly take up too much room and have a 'front' that would have to face a certain way..whereas this circular design, would be more sympathetic in terms of space - and in theory can be positioned however I want. This plan allows trains to pass 'between' the wall (the big grey line -darker grey is the stepped part) and Kiln, and now I have removed the built up area at the back for aesthetic reasons, I want to make some proper shrubs and plants for the corners, allowing the train to pass between them and the scene too. This all saves adding to the board or building a new log store - and I think looks pretty good too in my opinion - but if anyone has further suggestions or ideas I would love to hear (well read) them too. Last edited by demaine22 on Mon Nov 07, 2011 1:37 pm, edited 2 times in total. This is a cool thread for a micro - but an alternative use of the word kiln comes to mind - allowing for a slightly different theme. I have attended art fairs where potters do their firing in an open fire barrel and the piece of pottery is then plunged into a trash can full of sawdust the create the incredible beauty of the raku technique. Just another thought. 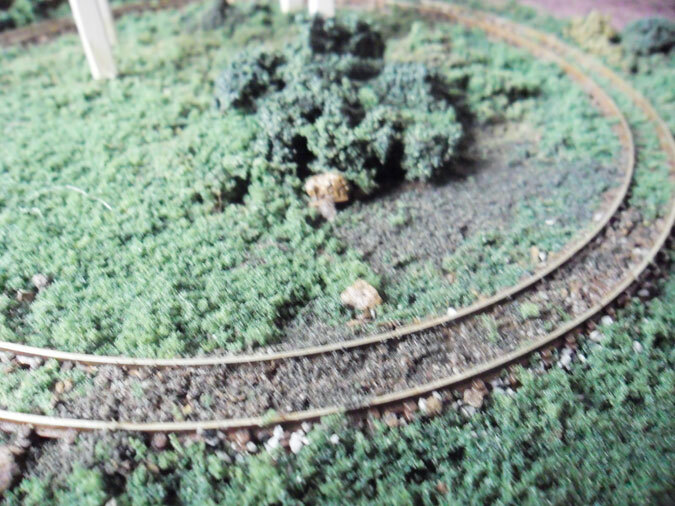 Yes, that is what I meant, with perhaps the whole front of the layout as the 'yard' and in gravel/weeds and the back half 'woods' (I wouldn't necessarily remove the built up areas or have a fence at the back). 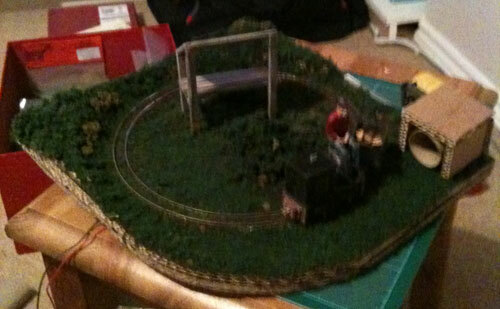 Oops: on looking at your layout photos I realised there would not be space outside the track for the third object I suggested to make the 3rd side of the 'yard'. The round kiln looks a bit space-shippy to me and it is not obvious what it does. 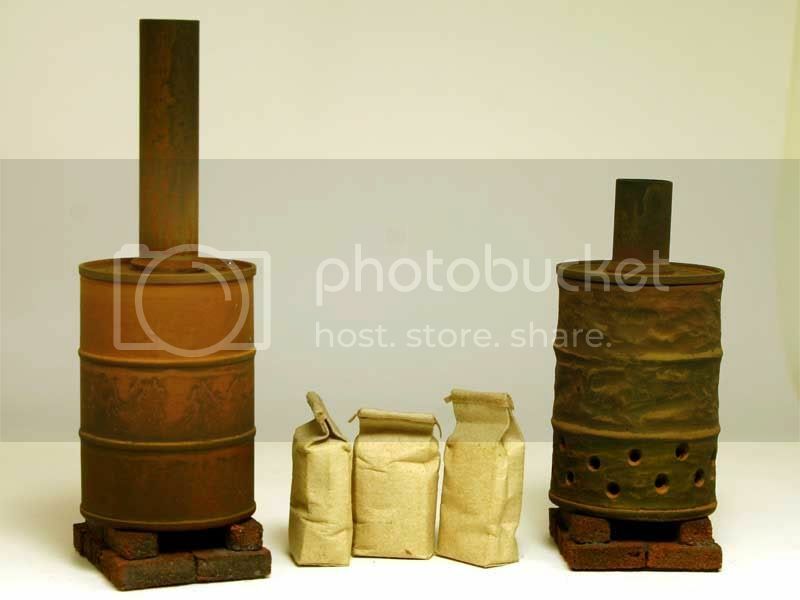 I really like the photos of the log stacks and kiln you posted on your blog. - this kiln (and more especially Steve's model kilns) are obviously meant to burn something. Perhaps before you finalise the layout you could decide what purposes you want the train to have, for example: bring in logs to be dried in the stack, take the logs from the stack to the kiln. Do you see the kiln having a road connection (to take away the charcoal and bring the workers) or is rail the only connection to real life, in which case it will need to transport charcoal, workers and supplies. Your answers might determine what structures the layout has and how it should be arranged. For example, at the moment the train goes close behind the log stack, so if it brings logs to the stack you don't see them being unloaded.